enlarge This is the view a doctor sees looking into your eye. The small red dots are 'microaneurysms', tiny damaged capillaries. The bigger red blobs are small haemorrhages, little flecks of blood. The white dots are exudates (leakage). Your sight is not affected at this stage.This is the term given to early damage of the retina in diabetes. Your sight should be perfectly good at this stage. A doctor examining your eye will notice tiny abnormalities. A doctor or optometrist may see 'dots' and 'blots'. The dots are some capillaries that have enlarged, that is the the tiny blood vessels enlarge to form microaneurysms. See photo tour and photo and photo. 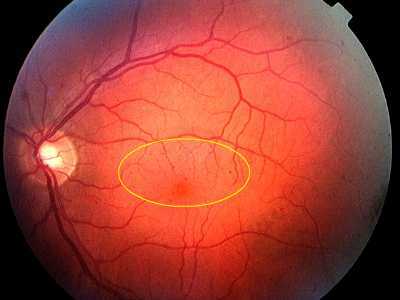 The blots are tiny haemorrhages, that is tiny spots of blood, on the surface of the retina. There are also leaky areas, called exudates. See photo. What does it mean if you have 'background retinopathy'? The number of microaneurysms, the little red dots the doctor sees, indicate the likelihood of more severe problems in the years to come. See photo. As the damage is mild at this stage, your sight will be nearly perfect. However, the condition does progress. It occasionally progresses quickly, but usually changes slowly. If your diabetes and blood pressure are well controlled, and have been all the time you have had diabetes, changes should be very slow (prevention) are controlled. Unfortunately for many people with diabetes the retinal damage increases, and maculopathy or proliferative retinopathy develop over a few years. Background retinopathy generally means your diabetes is not controlled as well as it might be. If you have been diabetic 30 years, even with the best control, these may develop. But most people who have background retinopathy have not been diabetic that long, and need better control as per these targets. Retinopathy progression appears to follow different patterns. Some patients develop leakage (such as macular oedema), and others develop capillary closure (which also causes loss of sight, see proliferative and pre-proliferative). See. The number of haemorrhages and microaneurysms indicate progression. If they increase in number the retinopathy is getting worse. Dropping blood pressure to the targets above will slow down progression right away. But if there is significant retinopathy, it takes 3 years of low blood sugars (eg HbA1c <58mmol/l 7.5%, the lower the better) before good control helps. This photograph shows 'circinate' retinopathy. Laser treatment is needed (early maculopathy). Good diabetic control is needed. Circinates further from the macula would be classified as 'background' or early none-proliferative retinopathy. Alcohol should be limited to one drink or unit a day, six days a week (Mukamal 2004). More than this leads to brain damage. Oily fish such as sardine, salmon, tuna, trout, at least twice a week (small amounts are fine...not a whole salmon!). Fibre and healthy fats in the diet slows down retinopathy. No transfats and minimal saturated fat. The lower the better in macular oedema, as long as you feel well. An ideal pressure is below 115 (systolic, first number) for healthy people. <120 is is only suitable for new/well diabetes patients 2012. Otherwise slightly higher as above. Home monitoring blood pressures should be 10mmHg (systolic) and 5mmHg (diastolic) lower see than these 'clinic' pressures. Depression & anxiety increase BP. <58 mmol/mol (7.5%) for insulin users; <48 mmol/mol (6.5%) if not using insulin and have good health. Problems with intensive control. Target should be adjusted according to health and age. If you are a type 1 patient and cannot achieve good control, you need to checked for other conditions such as coeliac disease (anti-TTG antibodies), addisons, and thyroid. If hypos develop, seek expert advice from your diabetes nurse/doctor. if your HbA1c is high (say 97mmol/mol / 11%), then the next step may be to achieve 75 (9%)....in other words, and any improvement is helpful, gradually reaching lower levels above. A sudden improvement in control (HbA1c drop of 33 mmol/mol/3% ) will lead to a temporary rapid increase in progression of retinopathy: laser may be needed. A temporary increase in retinopathy is most common when starting insulin for the first time, especially if the diabetes is very badly controlled when you start the insulin. <4.0mmol/l, and statins recommended for most adult patients with diabetes whatever the cholesterol. A fibrate such as fenofibrate is advisable in nearly every person with retinopathy. They reduce retinopathy progression 40% (Fenofibrate 200mg od) Field Study. We now recommend these for all adult patients, and they can be used in addition to a statin. If GFR low but still >15, need a lower dose. even 'Just one cigarette a day seriously elevates cardiovascular risk ' BMJ18, so it is best to stop completely. Insulin pumps generally produce better control still, but are harder to use. everyone with diabetes should attend an education course, such as DAFNE (insulin) , DESMOND (type 2 at diagnosis), or XPERT (type 2). Primary Care Trusts are obliged to send you on such a course, but very few patients have ever attended one. If you have not been on one, discuss this with your diabetic team. Get a diabetes buddy. this contributes to macular oedema and loss of sight (Schwartz, 2006), and many serious problems. It is common in diabetes, particularly if you are overweight. Do you have sleep apnoea? for patients who test their glucose levels and adjust insulin doses, the new glucose sensor is highly recommended and has transformed the lives of many patients. The cost is about £30/week).